Enjoying the sun filled days of spring and summer is a special time for any home owner or outdoor enthusiast. But the one harsh lesson we learn as a warm sunny day progresses is that the sun just doesn't settle in one space in the sky. The sun starts low in the morning, high at mid-day, and low in the evening. So if we don't have a tilting patio umbrella we are faced with either physically moving where we are sitting our lounging or actually picking up our shade and moving it so it's shade covers us from the sun. Frankly, this is a frustrating situation. Enjoying a day outside but having to get up and lug around furniture or on non-tilt umbrella can totally ruin your day. Why move around heavy furniture or a big umbrella when they can do the job of shading you without moving? Introducing the tilt patio umbrella. By pushing a button, or turning the crank, or even the ease of adjusting a collar, you're umbrella can shade you all day long no matter where the sun is in the sky. A tilt patio umbrella, whether it is auto tilt, collar tilt or traditional push-button tilt , can save you a lot of work and headaches associated with shading yourself from the harsh effects of the sun. Each type of tilting patio umbrella has its benefits and challenges.So it's important to balance what you want from any patio umbrella that offers a tilt function. The Automatic Tilt umbrella, also called auto tilt umbrellas, are a great innovation that literally changed the face our outdoor patio. This is simply a great feature that has quickly grown into the most popular feature in any outdoor umbrella, ever, and it’s quite simple in its application. 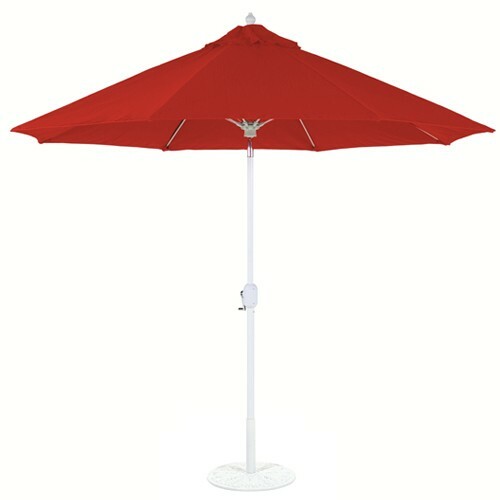 All aluminum umbrellas usually open by turning the crank, found at an optimum placement just above most table levels. Most aluminum umbrellas open by using the crank. But the automatic tilt umbrella has an added feature that’s, well, just great. Once the umbrella is completely open, you keep turning the umbrella crank, and the umbrella tilts. It works by a series of mechanical levers and joints inside the umbrella pole. And because the tilting feature in automatic’s don’t rely on joint settings (it uses the tension and position of the interior cord for position,) the tilting positions run the full spectrum of positions. In an automatic tilt umbrella, there is no preset or default tilt positions, so you can tilt your umbrella just a little, or a little more, or a full tilt. That’s what makes the automatic tilt umbrella the most popular tilting feature in the US. In fact, the umbrella is so popular, that it’s hard-pressed not to call it outdoor furniture because it’s just not limited to the outdoor table anymore. 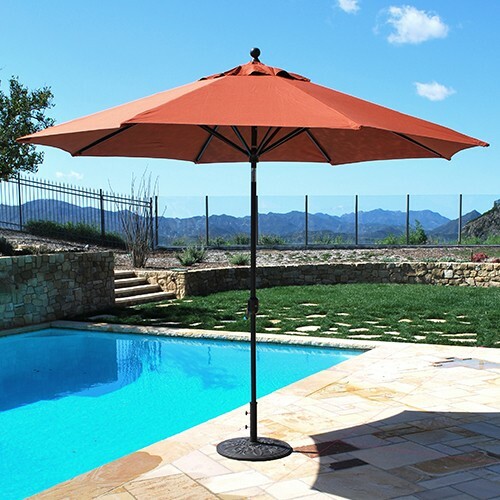 You can find auto-tilt umbrellas anywhere, like poolside, or smaller shading areas in your patio. Summary: The most popular tilt function in the US for a reason, the automatic tilt is just a joy to have and easy to use. 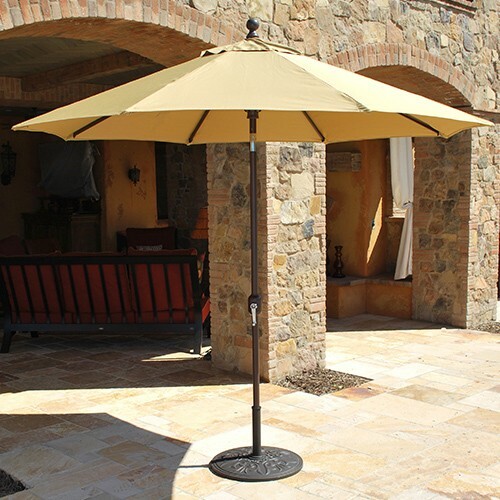 Usually automatic tilt umbrellas come in a plethora of sizes, frame colors and cover choices, and it’s also considered a “best bet” choice among patio experts across the nation. The collar tilt umbrella is a neat little innovation in tilting that sprouted up in the early nineties. Also considered an auto tilt, it’s a great example of user-friendly engineering that can really add to your table use umbrellas. A collar tilt umbrella works basically the same way as other aluminum market umbrella. You turn the crank at the housing, and the umbrella opens. However, what makes the collar tilt different is that at the top of the crank housing, there is a ring or “collar” that tilts the umbrella. By turning the collar, you can tilt the umbrella. Similar to an auto-tilt, the collar tilt umbrella has infinite tilting positions. Many people prefer the collar-tilt to the auto-tilt for its smooth operation and differentiated tilting mechanism. Summary: A great feature that brings a new twist (pun intended) to umbrella tilting, the collar tilt is an enjoyable function for those looking for something just a little bit different, with the same ease of use as an auto-tilt. 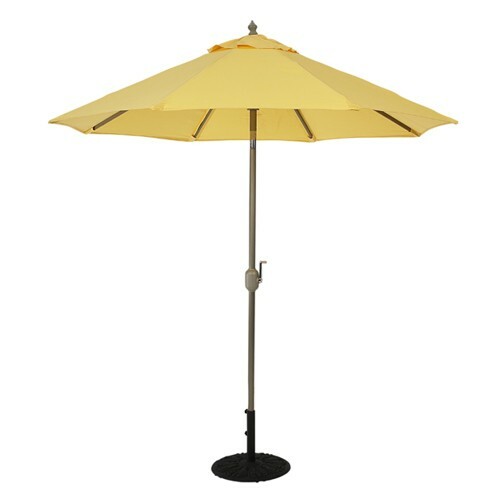 A perfect table umbrella for long lazy days of entertaining your house guests in your patio. 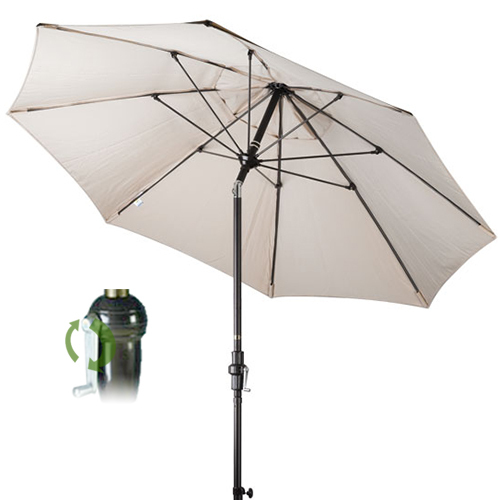 The Push-Button Tilt patio umbrella is the granddaddy of tilting umbrellas. Built on a simple but very sound engineering principle, push-button tilts have been around almost as long as the modern patio umbrella. 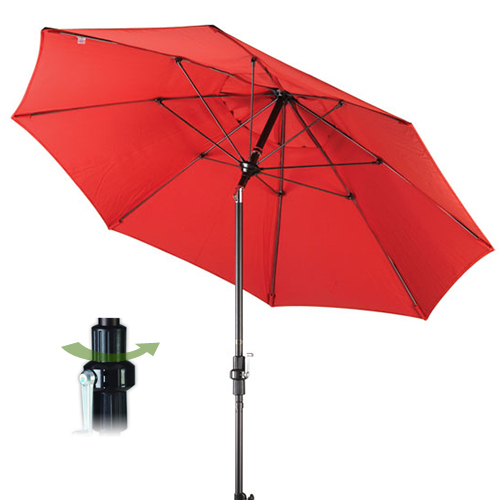 Evolving from an original hole-and-peg system, the push-button tilt quickly became a standard umbrella feature. The basic function is this; at the top of the umbrella pole, just below the umbrella ribs, you’ll find a button. The button is usually a simple, inward curved button made of metal. Push the button inwards, and you release a lock on the lever that allows the umbrella to tilt. Typically with a push button tilt, you have to manually hold the umbrella canopy to in order to get it into the right position. Most quality push-button tilt umbrellas have three positions, however, some are known to have two, or even just one default tilt position. Once you find the tilt position you want, you release the spring loaded button, and it locks the umbrella tilting lever to the position you’ve chosen. Summary: If you need a simple, standard umbrella with no bells and whistles, this is the tilt for you. 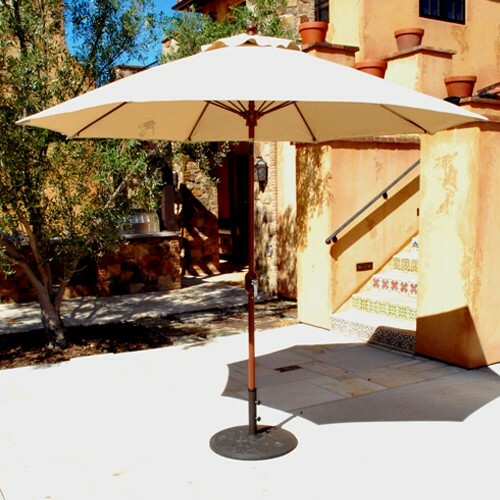 Also, if you have a large patio area that you’d like to put more umbrellas in for different shade areas or your house guests, but don’t want to run the expense of buying upper-end umbrellas for all of your shading areas, this is the perfect umbrella. 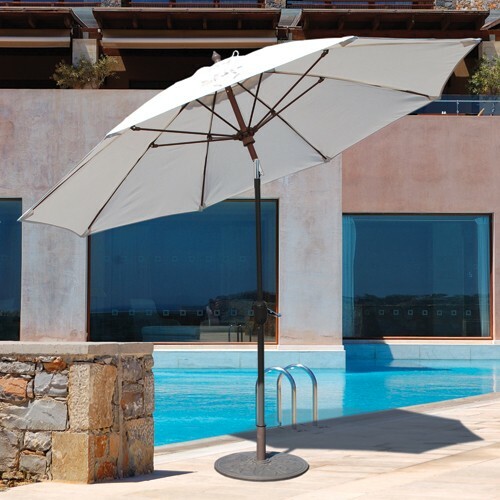 It’s also a great umbrella for commercial applications such as restaurants, pools and hotels.